1) 1981 doesn't seem like that long ago. 2) We had plenty of warning. 3) I seriously need to update my résumé. I realized that my tophat twitpic was a little hard to see, so I present it here for a closer look. 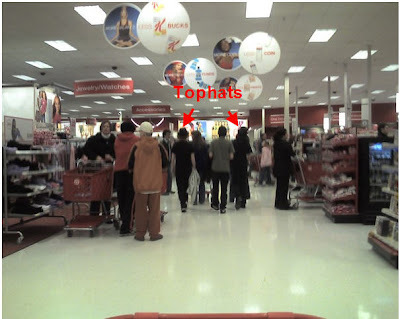 Tophats - they're making a comeback among the high school kids. A couple of months ago, I said I would try "theme Fridays" and present a classic song every Friday. That lasted one week. So, I will never again promise a theme but I will try to get off my duff and share some songs that are my favorites at least once a week. Today's song "Goodnight Tonight" by Wings. This one came out in 1979. The older I get, the more I appreciate Paul McCartney and Wings. It's really one of my favorite bands and there is really not much that dates this song, even today. It's not really disco or "soft 70's" - it stands quite well on its own. This is as low as it got here and we've already rebounded to 10. The power stayed on. The pipes are good. We were in the old house for the last real cold weather like this. Of course, at about 1AM, when it was 7 degrees, the lights went out. That seems to be typical for this area. The power went off again a few weeks ago when it hit 15 degrees so I am not looking forward to the next couple of days. Maybe they have the kinks worked out by now?This house is only 5 years old and I feel a draft. Shoddy construction? Nahhhhh. Don't get me started on that. Well, that's it. It's 1:24 AM and I am heading to bed so I can get my 5 hours in. Good night! 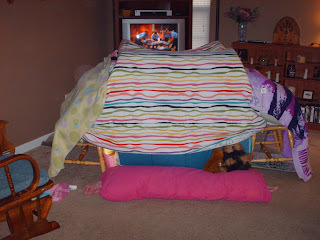 I started out the morning by building the kids a blanket/chair tent in the living room. Doesn't everyone do this from time to time? I may build one for myself so I can sit in it when I have a bad day at work. Of course, the rain came and flooded the yard again! This was barely a half an inch - I would hate to see what a full blast storm would do. Luckily, we have snow in the forecast since it will be much colder next week. That means no more rain and maybe the yard will dry out a bit. Looks like we'll be buying a truckload of topsoil for the backyard this spring. These are actually little seeds or something (I do not have a green thumb) that are floating on top of the water. It is quite odd. It will take quite a bit of soil and grass seed to fix all of this mess! 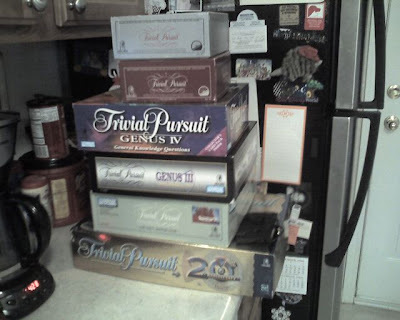 The other night I mentioned Trivial Pursuit games that I have piled up over the years. Here they all are - piled up and ready to head to the thrift store. The two on top are at least 25 years old. We spent a lot of time playing these but they are pretty dated now and are just taking up space. Hopefully, someone will get some use out of them! I guess I held on to all of these because my mother bought most of them and was the key person who insisted we play - a lot. I owe all of my knowledge of useless trivia (and most other things) to my mother. It's funny what you get "attached" to. These are just board games. I've gotten rid of so many things over the last year - it's amazing that I made trip after trip to the thrift store and still allowed these games to stay. 9:42 PM and it is STILL raining! Just some odds and ends tonight. 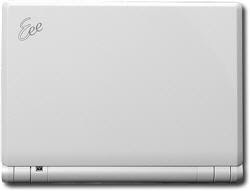 In recent news, I already broke one part of my "goals for 2009". I bought another book for the book shelf - a $3 copy of Billy Crystal's memoir. Shame on me, but I will get to it and it was just $3!! 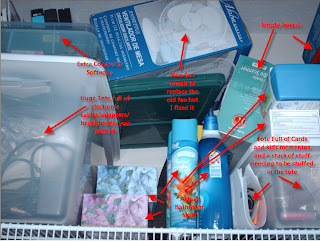 In updates for 2008: I think my biggest goals for the year was organization and simplifying. 1. Re-read Elements of Style.Do this in a last ditch effort to start writing using correct grammar and sentence structure again. I have written technical documents for so long that anything more complex than explaining how to turn on a computer in kindergarten-level detail is becoming more and more of a challenge. 2. Read more. I started out three years ago with a couple of books that I bought to read but never found time to read them. I now have a two shelf bookshelf with one shelf completely full of books that I have bought with the hope that I will one day read them. I have sworn to buy no additional books (except for technical ones - sorry - it's my job!) until this shelf is cleaned off. Reading more will also help me correct my bad writing habits (see #1). I still couldn't figure out how to make TwitPic work with my phone today (I think I got it tonight), so I had to wait to share these pics. I decided to take a few pictures to show how my New Years Day went. I did not take any pictures of packing up and putting all of the Christmas stuff in the attic, but I have the cuts and bruises to show for it. Redbox was finally up and working today. I am starting to understand their racket. Every time I rent movies, I go to return them and the machine is always down. And no - I am not waiting until the last minute either. This machine was stuck on "Inventory Processing" last night. The one down the street was stuck on a Dell boot screen. I guess I was meant to return them a day late. I got behind this woman with her kid. 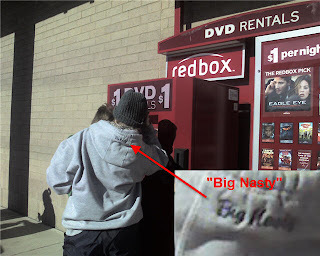 Notice that she proudly had "Big Nasty" embroidered on her sweatshirt. I bet her son is extremely proud.